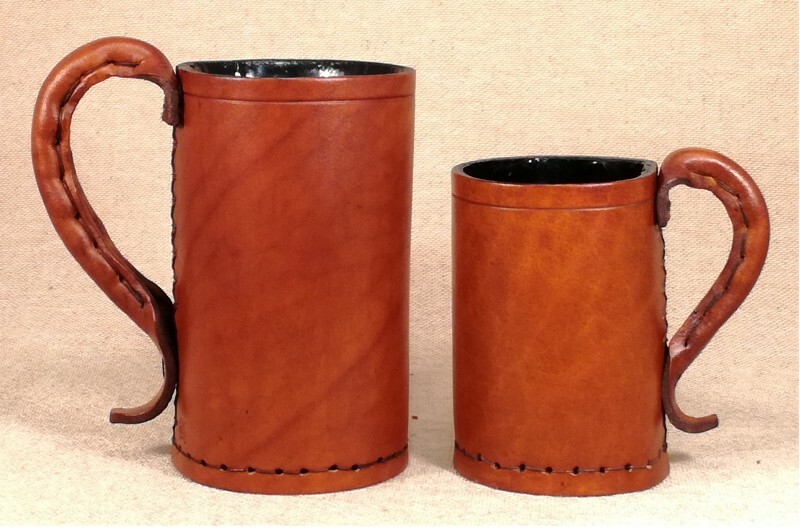 Historically, leather drinking vessels were lined with boiled resin of the birch tree or brewers pitch. Our jacks are now lined with epoxy resin to echo the historic use of resin. Click here for more information within the Internal Lining section of our Facts page. The Traditional Jack of the medieval tavern obtained its name from the material used in its manufacture being Jack leather which is still created by soaking in very hot water. When dry the leather is very hard and stays in shape. A common trick in the ale house was to over fill the jack with pitch, thus creating a short measure for which many alewifes were pilloried in the 13/15 centuries. Large Jack height approximately 15cms with capacity approximately one pint. Small Jack height approximately 11cms with capacity approximately half a pint. As seen in Pirates of the Caribbean and Robin Hood (2010).